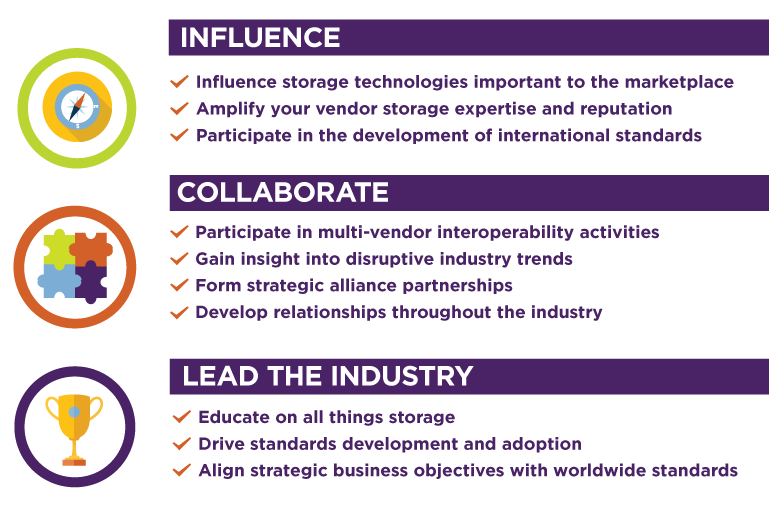 SNIA’s mission is to lead the storage industry worldwide in developing and promoting vendor neutral architectures, standards, and educational services that facilitate the efficient management, movement, and security of information. As a member of SNIA, you can contribute to a far-reaching variety of activities. "SNIA is the single-stop organization to get a sense for all storage, information management, and data related advancements in the Industry. If you seek to influence in any of these areas, you should be involved with SNIA." A new membership structure and fees has taken effect as of December 1, 2018. Read more about the new structure and fees in a letter from SNIA Executive Director Michael Oros. A Member is in the business of manufacturing, licensing, servicing, consulting, designing, researching/publishing, using or selling software, specifications, architecture, hardware or services related to storage or storage networking systems or technologies. An End User is an organization that is the ultimate final consumer of a product or service, and is typically represented by the IT department of an organization. End users may join as dues paying customer company members or as individual members. The SNIA grants complimentary access to qualified Non-Profit /Educational Institutions. “Non-Profit Institution Member” is defined as an accredited non-profit institution that agrees to comply with the SNIA Membership Agreement. An “Educational Institution” is defined as any accredited higher-learning institution. Please contact membership@snia.org for consideration. A Technology Affiliate member is a restricted voting membership specific to a technology domain, focused on technical specifications and interoperability. A Technology Affiliate member does not need to be a full member of SNIA.